(From Carl Zeiss lens literature) This virtually distortion-free, classic Macro Planar lens is in a league of its own. Thanks to a unique combination of high speed and consistent image quality from infinity to half life size (1:2), it offers features that no other lens of this class can match. Since the company firmly entered the SLR market in January 2006 with its ''Z'' series of lenses, Carl Zeiss has steadily released new lenses in the series, including two macro lenses, the 50mm ƒ/2 and 100mm ƒ/2. The 50mm ƒ/2 Makro-Planar is available in the Nikon F-mount, the Pentax/Samsung K-mount and the M42 screw mount. The 50mm ƒ/2 is designed to cover a 35mm frame, built to ''old-school'' specifications that guarantee compatibility with older camera bodies. 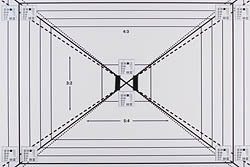 On a sub-frame digital sensor body, the lens will have an effective field of view of 75mm. The lens takes 67mm filters, comes with a bowl-style metal lens hood, and is available for around $1,000. The Carl Zeiss 50mm ƒ/2 Makro-Planar is fairly sharp when shot wide open at ƒ/2, but stopped down to ƒ/5.6, it becomes about as sharp as our tests can measure - both on a cropped-frame sensor on our D200 test body, and on the full-frame FX sensor of our D3 test body. Let's look a little closer at the results. Wide open at ƒ/2 when mounted on the D200, the Carl Zeiss 50mm ƒ/2 produces a nicely sharp ''sweet spot'' in the central region of the frame, with some trace of corner softness (our copy appears to be slightly de-centered, favoring the left side). Stopping down to ƒ/2.8 offers a gradual improvement to this sharpness profile, but is essentially similar - a sharp region in the center, and slightly soft in the corners. It isn't until ƒ/4 that we start to see corner-to-corner sharpness, with just over 1 blur unit in the center and 1.5 blur units in the corners - for all practical purposes, this is about as sharp as you'll ever need. But at ƒ/5.6 the lens offers tack-sharp results, as sharp as our tests will measure, a measure which is repeated at ƒ/8 (either of these apertures is the optimal setting for sharpness). At ƒ/11 diffraction limiting begins to set in, but sharpness is barely affected - it still doesn't exceed 1.5 blur units from corner to corner - it isn't until ƒ/22 that we note any real degradation of image quality, at just over 2.5 blur units across the frame. On the full-frame D3, we see about the same details as we noted on the D200, except for slightly more exaggerated corner softness wide open at ƒ/2 or ƒ/2.8. Image sharpness is still amazing at ƒ/5.6 and ƒ/8, and remains so all the way to ƒ/22, where it hits just over 1.5 blur units. In summary, the lens offers exquisite results for sharpness when used in typical macro situations - stopped down to take advantage of what fractional depth of field exists in closely-focused situations. Used wide open, sharpness is still excellent in the center of the frame, making the lens a useful for portraits by isolating the subject with slightly soft corners. Mounted on the sub-frame D200, we note an excellent example of a camera taking advantage of the ''sweet spot'' of a lens - chromatic aberration is virtually non-existent. On the full-frame D3, with its automatic chromatic aberration reduction, we see a similar story - almost nothing to report, making the 50mm ƒ/2 makro-planar very impressive indeed. However by running a RAW image through Bibble and avoiding the automatic CA removal, we can get see how the lens performs in this area in a way that is more useful to users of cameras without the D3's CA removal feature. CA is indeed present, but not objectionably so; if CA does appear, it only appears in the corners, and only when the lens is stopped down. In the worst case scenario, CA shows up in the corners at just shy of 6/100ths of a percent of frame height. Corner shading isn't a significant problem with the 50mm ƒ/2 mounted on the sub-frame D200; when used at ƒ/2, the corners show up as a half-stop darker than the center. At all other apertures, it's less than a quarter-stop. On the full-frame D3, corner shading is more significant. At ƒ/2, the corners are a full stop darker than the center; at ƒ/2.8, corner darkness is less significant, at 2/3 EV. At ƒ/4 we see a quarter-stop difference between corner and center, and at other apertures it's less than that. The Zeiss 50mm ƒ/2 barely shows some very slight barrel distortion. On the D200 the effect is less significant: less than 0.1% distortion in the corners. On the D3 it's double that, at just over 0.2% corner distortion. Fortunately, it isn't a complex distortion and is easily correctable with post-processing software (if it proves to be objectionable at all). The Zeiss 50mm ƒ/2 is a manual focus lens. Macro purists may object to the fact that the image reproduction ratio for this lens is in fact only 1:2 (0.5x); images are not reproduced as ''life-size'' on the sensor. However, it performs very well in this capacity, with a minimum close-focusing distance of 24 cm (just under 10 inches). This is from the image plane, so taking into account the length of the lens, this means you can be as little as 3 1/2'' away from your subjects. The width of the subject area at closest focus is 45mm on a sub-frame sensor body, and 70mm on full-frame sensor body. Carl Zeiss has taken a retro approach with its line of ZF lenses, in that instead of adopting a new design approach they are solidly capitalizing on a proven concept of an old design. The sample we tested is built with the old Nikon ''rabbit-ears'' AI indexer, to ensure compatibility with some of the oldest Nikon bodies produced. The lens design consists of 8 elements in 6 groups, with a nine-bladed diaphragm making up the aperture. The production quality of the lens is superb; the entire construction is metal, from lens mount to filter rings. Accordingly, this makes it comparatively heavy at 530g (over a pound). Unless your newer camera body supports AI- or AIS-style lenses, you can forget about ''advanced'' modes such as aperture priority; it will be manual mode all the way. And you can forget about metering, as well. With a price tag exceeding $1,000 though, my sense is that the average purchaser of this lens will not have such problems. Those issues aside, the lens is wonderfully presented, with a distance and magnification scale etched into the focus ring. A depth-of-field scale (complete with infrared index) is adjacent to the aperture ring. The aperture ring itself clicks between ƒ/2 and ƒ/22 in half-stop intervals. A short, 3/4 inch-deep metal bowl-shaped metal lens hood completes the ensemble. The lens hood can be reversed for storage on the lens. The design of the lens, however, almost precludes the need for a lens hood; the front lens element is set back about two inches from the front of the lens, providing its own ''interior'' lens shroud. 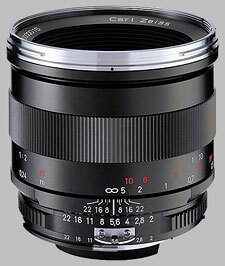 The focus ring is the main operating feature of the lens. It's 5/8-inch wide, with a ribbed metal texture. There is plenty of travel on the smoothly-cammed ring - turning about 320 degrees brings you from closest focus to infinity. It's also worth noting that the lens gets 1.25 inches longer (just over 3cm) when focused at its closest point. Very different animals, the 50mm macro is much sharper at ƒ/2, but at ƒ/2.8 the tables are turned and the 50mm ƒ/1.4 is sharper. By ƒ/4, we see similar performance between the two lenses. CA results are decided better for the macro lens, but with CA removal on the D3, the results are similar. Corner shading is similar between the two lenses, but the 50mm ƒ/1.4 distorts just slightly more. For Pentax users, this is the comparable lens. We haven't yet tested this lens, but it is substantially lighter and less expensive, and offers full 1:1 macro reproduction, as well as a closer minimum focusing distance (19.5cm instead of 24cm) at the price of only offering ƒ/2.8 as the maximum aperture. The Sigma 50mm macro lens is much lighter and less expensive than the Carl Zeiss 50mm macro, and like other lenses in this section, has the benefit of autofocus capability. However, you lose one stop with ths Sigma's maximum aperture being ƒ/2.8 compared to the Zeiss' ƒ/2. In our testing, we found that the Sigma is actually slightly sharper than the Zeiss, but the differential is very small; by ƒ/5.6, both lenses are tack-sharp. The Sigma shows better results for corner shading and distortion (especially on a subframe-sensor body, where there is practically none), but CA is more present. The Sigma stops all the way down to ƒ/45, but image softness at this setting is pronounced (~9 blur units). At just over half the price of the Zeiss 50mm macro, this lens also bears consideration. Image sharpness results are almost on par (with a slight nod to the Zeiss), but the Nikkor offers autofocus, a closer minimum focusing distance, and full 1:1 macro reproduction. CA performance is slightly worse than the Zeiss, as is corner shading, but distortion is essentially a non-issue. As you can see from the above alternatives, there are plenty of lenses to choose from in the 50mm macro category for both Nikon and Pentax users. The Zeiss 50mm ƒ/2 has much to commend it: it's a full stop faster than its contemporaries, and its results for sharpness, chromatic aberration, corner shading and distortion are all exceptional. It's also built extremely well, with a construction finish that will last dozens of years and bear up well under harsh conditions. There are a two sticking points for this lens. The first issue is the lack of autofocus capability. While not essential, autofocus is very important when using a sub-frame camera body; there simply isn't as much real estate as a full-frame camera body in the viewfinder, to accurately judge focus. As well, most modern SLRs lack useful focusing features such as a split-prism focusing screen to assist in accurate manual focusing. The second issue is the fact that its reproduction ratio is only 1:2. If you shoot macro, this point alone could be a make-or-break issue for you. If neither of these issues matters to you, than it's a certainty you'll be more than satisfied with this lens. Sensitivity to backlight is obvious, sometimes inducing an increasing loss of contrast when stopping down from f/2 to f/8 for instance (typical case : shooting a pipe organ case against stained glass windows). Fortunately f/2-f/2.8 are quite good in terms of sharpness, so stopping down does not feel necessary for flat subjects at least. Coma is not outrageous but still significant (yes, I use it for night shots with good results). Nine lens blades, but straight ones, yielding nice sunstars but also sharp enneagons from time to time (less nice). On the positive side, sharpness, bokeh and overall image quality are excellent. Distortion is negligible (but for certain reproduction works). CA is also extremely low, in particular longitudinal CA. While not an APO lens, it comes very close. Also, while heavy and bulky in the bag, with the camera in hand (Df in my case, most of the time) it balances well and is very pleasant to handle. I use it more often than all other 50mm (AIS or AF) together. This is another of the utterly splendid Zeiss lenses designed to mount onto the Canon bodies without any adapters. What a piece of photographic gear, it is just so properly manufactured. Image rendering is superb. It is one of the two or three lenses (all Zeiss) which out-resolve my 21mp body. This has the desirable effect or eliminating any manner of dithering or guessing by the camera body - what you see is what you capture. I prefer this focal length for portraits but am becoming adept at using it for pretty much anything. 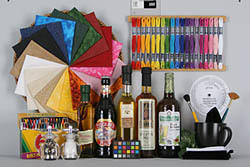 Highly recommended for the degree of detail and color rendering. Stop it down to f/4 and it is insanely sharp edge to edge. I've recently reverted back to using DSLRs after using Rangefinders; specifically Leica M8.2 and M9. I'm currently using a Nikon D3s Body which has amazing IQ + high ISO performance (something that the Leica's lack). The Zeiss Makro-Planar T*2/50 brings very similar image quality akin to the M-System Lens to DSLRs. This lens is very versatile; I use it extensively to make panoramas, take portraits and macro work. What I don't understand is why it came with such a crappy lens cap. For some reason its very hard to put back on and I'm paranoid of it falling off.